Photo by Jake Przytarski Marshall’s Jared Anthony looks to pass the puck during their game against Luverne on Friday. The Tigers defeated the Cardinals 4-1. MARSHALL – Fresh off of a come-from-behind road victory over Minnesota River on Saturday, the Marshall boys hockey team looked to create additional separation at the top of the Big South Conference standings with a win over Luverne that would put them within striking distance of the conference title. 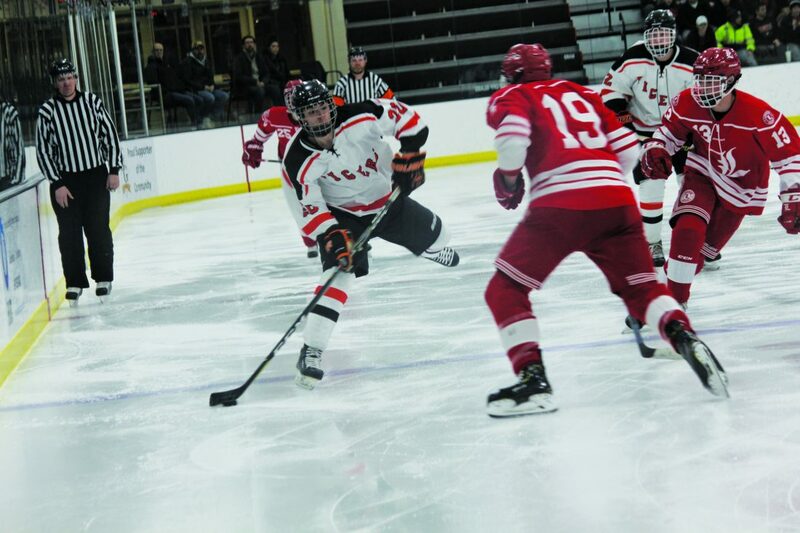 Powered by a sensational effort on special teams combined with another razor-sharp performance in net by Dominik Caspers, the Tigers got the job done with a 4-1 win to sweep the season series with Luverne and improve to 14-1 in conference play. In what would become the story of the game, the Tigers spent much of the first period down a man but kept the scoring chances to a minimum thanks to a strong defensive effort by the penalty killers. With the bulk of the action relegated to their defensive zone, the Tigers could only generate eight shots on goal but kept the game scoreless through the first period with Caspers stopping all 11 Cardinal shots on goal. Early in the second period, the Tigers killed off their third straight Cardinal power play before returning to full strength and lighting the lamp with Bryson Whyte picking up his 19th goal of the season and linemate Landon Frost adding the assist. Six minutes later on their second attempt on the man-advantage, the Tigers added a crucial second goal as Mason Plante slipped by a pair of Cardinal defenders and deposited the puck in the net for his 39th of the year to make it 2-0 Tigers. Bryson Whyte and Blake Kruse both picked up assists on the goal. Before the end of the period, the Cardinals found the back of the net for their first and only goal of the game and nearly added the tying goal moments later on a breakaway attempt. Standing tall, Caspers stone-walled the Luverne forward to keep the score at 2-1 heading into the third period. Looking to push the lead back to a pair, captain Plante added his second goal of the game and 40th of the year 12 seconds into the third period to make it 3-1 in favor of the home team. Late in the period, the Tigers went back on the power play for a fifth time and picked up their second goal on the man advantage to put the game away for good, as Plante found Tristan VanDeVere all alone in front of the net for his 18th tally of the season to make it 4-1. With the win, the Tigers improved to 19-2-1 on the season and will return to Red Baron Arena on Monday to take on Willmar in hopes of picking up their 20th victory.